The M.Zuiko Digital ED 12-200mm F3.5-6.3 is designed for Micro Four Thirds cameras like the new Olympus OM-D E-M1X and offers the equivalent of a 24-400mm lens in full-frame camera terms. The MFT mount means that it will fit on some Panasonic and Blackmagic Design cameras too. We already rate the smaller Olympus models as some of the best travel cameras you can get, and this long-zoom lens could be the ideal companion. It’s a further sign that Olympus is seriously committed to the MFT format after a year in which full-frame mirrorless cameras seemed to be grabbing all the headlines, and confirmation of a story first leaked two weeks ago. We have seen similar focal ranges for DSLR lenses, notably the Tamron 18-400mm f3.5-6.3 Di II VC HLD lens, which has an even longer focal range, but lenses with this kind of zoom range are usually big and bulky, where mirrorless cameras rely on small size and light weight for their appeal. The M.Zuiko Digital ED 12-200mm F3.5-6.3 is just 99.7mm long, however, and weighs 455g, so it’s a much lighter and more compact proposition than other ultra-zoom lenses for everyday use. The Micro Four Thirds format is sometimes criticised for using a smaller sensor than rival APS-C mirrorless cameras, but it allows smaller, lighter and more portable lenses. The 24-400mm equivalent zoom range inevitably brings some compromise in maximum aperture range, so at full zoom the maximum aperture drops from f/3.5 to f/6.3. This is standard with ultra-zoom lenses, and if you want a constant maximum aperture you have to accept the smaller zoom range of the Olympus 12-100mm f4 M.Zuiko PRO lens. Even though this new 12-200mm is not part of the Olympus PRO lens line-up, it’s still dust, splash and freeze-proof. It uses a high-speed, high-precision internal MSC (Movie and Still Compatible) autofocus system which moves a single, lightweight internal element. It also has Super ED and aspherical lenses to suppress chromatic aberration and distortion and comes with Olympus’s ZERO (Zuiko Extra-low Reflection Optical) coating to increase contrast and reduce flare. 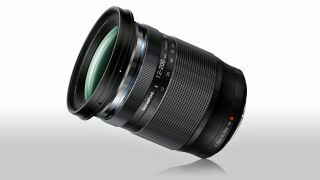 The M.Zuiko Digital ED 12-200mm F3.5-6.3 goes on sale from late March 2019 at a price of £799/$899.